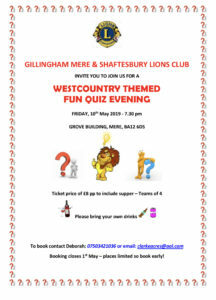 If you are looking for something to do Friday 10th May Why not come and join us at our next quiz. If you would like to take part please contact the number below. See you there. It will be lots of fun and laughter. Book your team now or miss out. GMS Lions continues helping to clear litter up. This time in Shaftesbury. Altogether we collected 23 bags. President and Debbie attend the official opening of Shaftesbury Abbey. Had a walk around the grounds in the fantastic sunshine. Also met up with Lion Chris . GMS Lions helped with some bulb planting. A little time back GMS Lions helped with some bulb planting in Gillingham near Waitrose thought you might be interested in seeing the results. GMS Lions help out with collectors for Marie Curie. A bit about GMS Lions.